The Australian developers planning a 52-story skyscraper in South Park have decided to aim a little higher—the project is now expected to reach at least 63 stories, planning department records show. The project by Crown Group would be designed by Koichi Takada Architects, also based in Australia. The architect offered a sneak peak at what the project could look like to the Australian publication Commercial Real Estate. 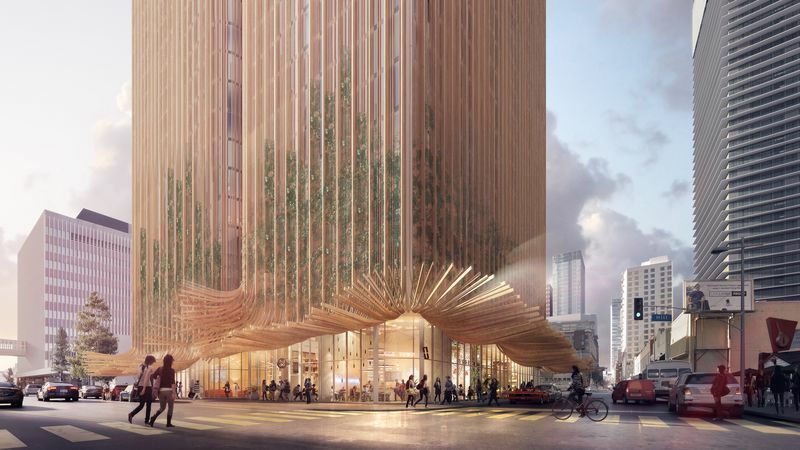 The development would be inspired by the California redwoods, Takada told CRE, and would incorporate living trees. It would be Takada’s first U.S. project. Takada also noted that the high-rise would reach 70 stories in height, but a department of city planning spokesperson confirmed to Curbed that the project was working its way through the entitlements process as a 63-story building—a 54-story tower atop a 9-story podium. 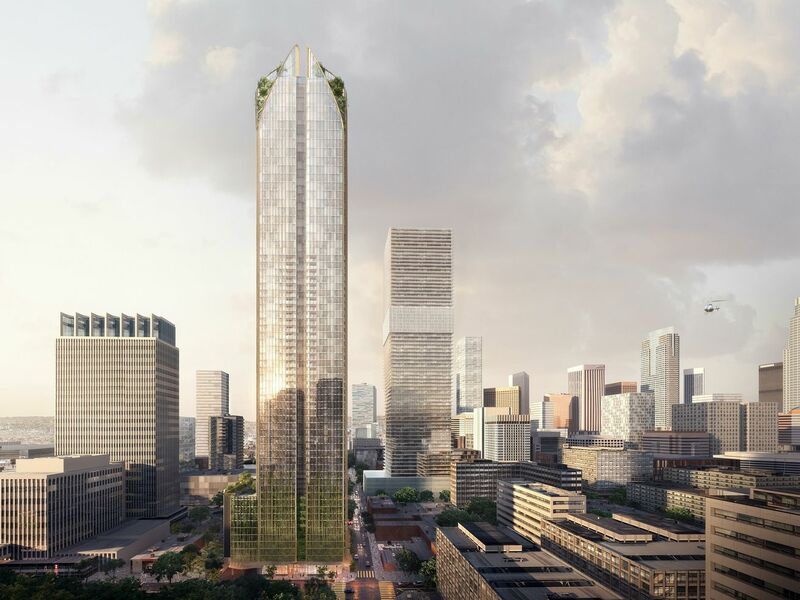 Renderings show greenery topping off the tower and climbing up from the ground level like dense vines. Along the street, a canopy intended as “a reference to the [blowing] skirt of Marilyn Monroe” flutters above the sidewalk. The tower would be topped off by a rooftop terrace. The project at 11th and Hill was proposed as condos. Planning documents filed with the city in December indicate that the residences will be mostly one- and two-bedroom units, with some studios and three-bedrooms. Parking would be provided by seven above-ground and six underground parking levels. A representative for the firm would not comment on the project or the details that Takada shared with CRE. The tower, seen from the intersection of Hill and 11th streets.